A standard poodle male sitting. The Poodle is a breed of dog, and the Standard Poodle is regarded as the second most intelligent breed of dog after the border collie, and before the German Shepherd. The poodle breed is found officially in toy, miniature, and standard sizes, with many coat colors. Originally bred as a type of water dog, the poodle is skillful in many dog sports, including agility, obedience, tracking, and even herding. Poodles are elegant in the conformation ring, having taken top honors in many shows, including "Best in Show" at the Westminster Kennel Club Dog Show in 1991 and 2002, and at the World Dog Show in 2007 and 2010. Poodles are retrievers or gun dogs, and can still be seen in that role. 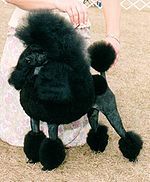 The poodle is believed to have originated in Germany, where it is known as the Pudel. The English word "poodle" comes from the Low German pudel or puddeln, meaning to splash in the water. The breed was standardized in France, where it was commonly used as a water retriever. The American Kennel Club states that the large, or Standard, Poodle is the oldest of the three varieties and that the dog gained special fame as a water worker. So widely was it used as retriever that it was bred with a moisture-resistant coat to further facilitate progress in swimming. All of the Poodle's ancestors were acknowledged to be good swimmers, although one member of the family, the truffle dog (which may have been of Toy or Miniature size), it is said, never went near the water. Truffle hunting was widely practiced in England, and later in Spain and Germany, where the edible fungus has always been considered a delicacy. For scenting and digging up the fungus, the smaller dogs were favored, since they did less damage to the truffles with their feet than the larger kinds. So it is rumored that a terrier was crossed with the Poodle to produce the ideal truffle hunter. Despite the standard poodle's claim to greater age than the other varieties, there is some evidence to show that the smaller types developed only a short time after the breed assumed the general type by which it is recognized today. The smallest, or Toy variety, was developed in England in the 18th century, when the White Cuban became popular there. This was a sleeve dog attributed to the West Indies from whence it traveled to Spain and then to England. The continent had known the poodle long before it came to England. Drawings by the German artist, Albrecht Durer, establish the breed in the 15th and 16th centuries. It was the principal pet dog of the later 18th century in Spain, as shown by the paintings of the Spanish artist Francisco Goya. France had toy poodles as pampered favorites during the reign of Louis XVI at about the same period. Most poodles have a dense, curly, non-shedding coat that requires regular grooming. Since poodles do not have the plush double coat of many breeds, their fur is often referred to as "hair", a term usually reserved for humans. [note 1] Most poodles are solid-colored, and many registries allow only solid colors in conformation shows. "Parti" (short for parti-colored) poodles have large patches of colors different from the main body color. "Phantom" poodles have the color pattern of a black-and-tan dog, although not necessarily black and tan. Solid-colored poodles may either "hold" their color (i.e., stay more or less the same throughout their lives) or "fade" or "clear" to a lighter shade. Usually the ears and the thicker guard hairs hold more of the original color than other hair. Poodles come in a wide variety of solid colors including blue, gray, silver, brown, cafe-au-lait, apricots, red and cream. Unlike many breeds, poodles can come in a variety of sizes, distinguished by adult shoulder (withers) height. The exact height cutoffs among the varieties vary slightly from country to country. Non-Fédéra..